Mid-Excursion 1 is fully booked. River Iijoki has been restored mainly due to its altered river morphology caused by intensive forestry and timber floating. 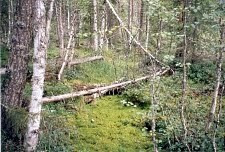 The excursion can be made to several different headwaters, because they are quite close to each other. The final excursion depends on how much time is used in one stream, eagerness to walk, discussion, and weather. Nokipuro: renovated 2006–2007. Before renovation, the stream was sandy and silted up. Various wooden deflectors and underminers are used with the power of the flow to dig and conduct the sand away. Water-protective structures have also been made in the catchment area, 5 ha of peatlands have been restored and forest ditches have been blocked off. Walking about 1,2 km. Kanervaoja: renovated 2004–2007. Before restoration, there were a lot of dry, old stream sections beside the digged ditch. Original stream sections are rewatered again. Walking about 2,2 km. Alahaapuanoja: renovated 2007–2009, Freshwater pearl mussel stream. Ditching on the catchment area caused accumulation of sand at the bottom of the stream. 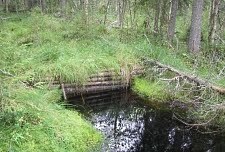 Various wooden deflectors and underminers were built to dig and channel the sand away from the stream with the power of the water. Forest ditches and overland flow fields in the catchment area are blocked off as water-protective measure. The upper part of the stream is very nice and pristine. Walking about 0,7–1.2 km. Mätässuonoja: renovated 2010, various wooden deflectors, underminers and stones. Walking about 1 km. Kylmäoja: renovated 2007–2008. Large spring (not entirely in natural state) beside the stream. 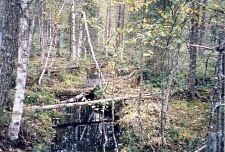 Wooden deflectors are made in the sandy and silted up stream sections, and water returned back to the original stream. Water conservation measures at the lower part of the stream. Walking 0,5–1,5 km.